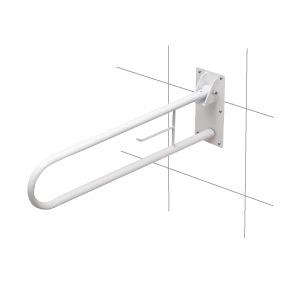 This grab bar has a space-saving design that folds up against the wall, provides two gripping heights to aid in sitting and standing, and built-in toilet paper roll holder. Made of 1" powder-coated steel frames with stainless-steel screws. Mounts to bathroom wall and includes all necessary hardware and instructions in English and Spanish. Weight capacity is 250 lbs. White. Measures 7 x 4 x 30.